How deep is the excess melanin? The skin is made up of layers, split by the epidermis and the dermis. The epidermis is the top layer while the dermis sits deeper underneath. Excess melanin caused by hyperpigmentation can be found within either layers. While the depth of the excess melanin would depend on the specific cause, it can sometimes be difficult to know how deep the hyperpigmentation is. However, the below can be looked at as a general guide. * Types of pigmentation with Yes in both columns simply indicate that melanin depths would vary case-by-case. Q: What does this mean? A: It means the choice of skin lightening treatments is critical to successful skin lightening. As expected, cases of hyperpigmentation found in the top layer only (known as epidermal melanin) are much easier to treat. 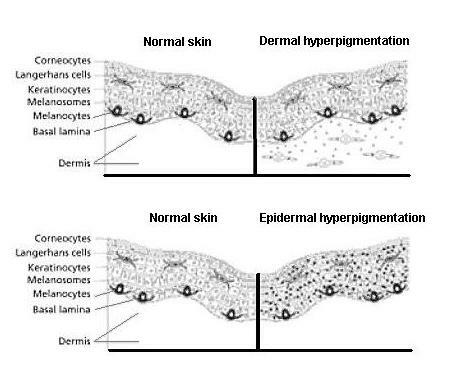 Epidermal hyperpigmentation are also responsive to over-the-counter skin lightening creams and lotions like those containing kojic acid or hydroquinone, while dermal (deep) cases do not respond to these treatments at all. Dermal or deep hyperpigmentation requires more invasive skin lightening treatments or changes made from within, if changes are to be seen. See the following diagram to understand this further. Compare the distribution and placement of excess melanin-containing melanosomes between normal skin against both epidermal and dermal hyperpigmentation. Melanin-containing melanosomes are indicated by dots. The pursuit of lightening excess skin hyperpigmentation can prove to be frustrating as many will inevitably find that what works for someone else will not necessarily work for them. This leads to disappointment and confusion, and many will chase one skin lightening cream after another in the hope of finding one that works. If this sounds familiar, it is likely that the reason for your stubborn hyperpigmentation is that it is simply buried deeper within your dermis, where skin lightening creams and lotions cannot penetrate. While this can be disheartening at first, it is the first step to your journey in finding out which skin lightening treatments may actually make a difference. My skin is a natural oriental yellow pale because if you look at my belly and the skin below my underarms inc underarns and places that have not been exposed to the sun are pale yellow. however due to prolonged exposure to the sun wearing sleeveless shirts, skirts, shorts etc my arms and legs have gone from yellow porcelain to a coffee caramel. I hate it because i cannot wear tube tops and things that will reveal tan lines and it looks awful on a girl. To make the problem worse, I previously had tinea versicolor which gives me colourless/pale white spots on my arms and i look like someone who has vitiligo or sickly. People have suggested and even the doctor to go and get a full body tan, unfortunately these spots don’t tan easily and goes red instead, and my chest and stomach does not tan for some odd reason so it stays pale. This is what started my journey in bleaching my skin altogether to match my original color and match the white spots i have on my arms. So far so good but i must tell you it takes alot of time and effort to stay this way. I first tried Diana Stalder products a month ago and my hands are extremely pale, my forearms, my neck and face are pale like my original skin tone. I found the diana Stalder Black soap and Surely white whitening body lotion for night time the ones that did work for my skin. When you first use the black soap your skin is extremely dry with powdery white ash on the skin that turns your skin in the area ‘white’ after 2 weeks I noticed my skintone was lighter. Little did I know that even wearing sunscreen spf nivea 50 PA++ does not prevent me from still tanning. Now I wear longsleeves and cover my entire body during the day with black or brown thick clothing. Only my hands, and head are visible and I found this to be the most effective as well as wearing the sunscreen underneath the clothing too. However after all this whitening regimen my lower arms are still dark in color and i think this part of my skin has been exposed the longest to the sun the most. I bought maxi-peel solution with hydroquinone 4% and tretinoin and yes it was over the counter for some strange reason. I applied it only twice at night on my lower arms and after 2 to 4 days they peeled like never seen before. The skin however the new skin still looks like its the exact same color to my old skin. I left it alone for a week and just continued to apply the diana stalder soap and lotion and i noticed that it has gone 2 shades lighter after a week. So peeling is very good because it takes the tough hard skin off and reveals a new and thinner layer making it easier for bleaching to take effect and penetrate. Make sure you buy diana stalder products especially the black soap for night time you can order this online. Make sure you have a solution with tretinoin and hydroquinone to peel your skin for easier penetration but do not use that once your skin starts peeling otherwise you will over kill your skin inc the new skin and will burn it and make it darker instead. While your skin is peeling, you can use the black soap and other bleaching lotions afterwards but to a minimum and especially do not use kojic acid soap on peeling skin as it will make your new skin itchy with bumps and redness and because its itchy means you scratch it and creating friction and darkening the skin even more. Don’t ever scratch, rub or scrub your skin you do not need to because the exfoliation has already been done by peeling. Last and most importantly, stay away from the sun and treat it like the black plague. When you are using whitening products, chemicals will react to the sun making your skin become even darker when exposed because your pigment cells will retaliate and create even more pigment because it has a memory. If you must go out, wear a sunscreen with atleast an spf of 50 religiously and after 30 mins cover your skin with dark clothing on areas where you applied the whitening products. when your skin is peeling make sure you make it an oath to double the amount of sunscreen and lessen exposure to sunlight immensely. You should only need to expose your sunscreened skin to the sun maximum 15 mins a day so make it your new routine, yes even if you have put sunscreen on, the heat from the sun will trigger the pigment cells to form, so 15 mins is all you have unless you are wearing protective and ‘thick’ clothing then perhaps 30 minutes to an hour is ok and that still requires sunscreen underneath your clothes. If you are serious about skin whitening, then treat it like this and follow my way of doing it because it works. And do not use whitening lotions, creams, solutions or soaps on your skin during the day, only apply them all at night. but that was long ago, i never tanned my upper body for almost 8 years, i bought exfoliting glutathione soap and it evened out my upper skin but its still brown,, im really sad, my face,legs,hands is light and my stomach,back is dark. im pretty sure my stomach and back has dermal pigmentation, and i know my natural skin color is light skinned, so how do i get that back. so please try to help me, what should i do, do you reccomend i try maxipeel 3 for my upper body,if so, please tell me how to apply it on my stomach and back and do you reccomend it or maybe something else. please i just want my natural skin color back, take a belt and put it around your waist, its like that for me,from there upwards its all dark tanned skin. please tell me and bear in mind i am 21 and dont want to damage my skin and body in the future. I have also natural light skin tone but back and stomach is dark.. ihave exactly same condition.. how did you treat it? Please i need to contact you.. I also found glutathione soap to be effective but if you are looking into taking the glutathione pills make sure you still stay away from the sun and make sure you do not have any auto immune diseases like thyroid like i have because then pills are futile and do not work. Make sure when you are taking glutathione pills look at the amount like if it is 100 mg of glutathione but only 50 grams of vitamin C then it is pointless. Vitamin C ascorbic acid needs to be double the amount of glutathione to work. Take a gluta pill and 1000mg of vitamin C or even just Vitamin C alone and it will lighten your skin from the inside out. This takes a long time so prepare yourself in taking them 6 months straight with an empty stomach each time and it will work. Kojic acid products also work but will not lighten a wide area of your skin like if you are only looking at getting rid of age spots and freckles then kojic acid is great but if you’re looking to bleach your overall skintone it does not work. Hydroquinone, arbutin, glutathione, licorice extract, nicotinamide, vitamin c, etc are chemicals that can whiten a wide surface area of your skin but hydroquinone should not be used more than 10 percent of your total body surface when you apply so if you’re looking at applying hydroquinone on your legs and arms, do half an arm and so on one at a time. Otherwise your liver will fail because it is toxic but is heaven in bleaching compared to other products. also Tretinoin or retin – A will not lighten your skin without hydroquinone and it will only peel your skin but not lighten. Avoid using products with hydroxys, acids of any form when you are applying hydroquinone and tretinoin, just not at the same time or your skin will have a tan stain that is temporary but eventually become permanent. when your skin is peeling, apply vaseline or moisturizing lotions not whitening lotions because the new skin might become irritated and therefore darken. Keep drinking tons of water atleast a litre and a half a day and keep it moisturised. 1. As soon as I wake up I go and take a shower with warm water to open up the pores of my skin. 2. While doing this I use glutathione soap or a normal soap to wash my whole body not the face. The face should not be burdened with all kinds of different bleaching chemicals, only stick to one. During the day I wash my face with a normal face wash (not whitening soaps). 3. I lather up the gluta soap on my body and wait for about 5 minutes or more because gluta is quite mild and won’t irritate most skin types. 5. After a shower, straight after a shower after towelling my skin dry I apply sunscreen on my body, note you dont have to apply sunscreen on your entire body – just on areas that you have the heavy dark pigmentation and areas where you apply alot of whitening products on. I use Nivea SPF 50+ PA++, a PA and a good brand is all you need with atleast 2 ++. You can use higher than 50 but not less than spf 50. For the face I also use Nivea spf 50 one that is specifically for your face. Sometimes I use ‘Olay’ natural white UV blocker its an spf 30 but you gotta make sure you wear a hat or put a layer of nivea sunscreen. 6. I then put on a long sleeve shirt and long pants. The material on the clothing needs to be something like a denim material one that is thick, or if it is too hot wear silky clothing/ satin that is shiny. 7. When I come home after the sun has gone down around six pm I take another shower or if you dont wanna take too many showers then sponge bathe in the sink only washing the parts of your body that you are trying to lighten eg: your arms, legs, neck, chest, face etc. When I go in for the second shower I use the ‘black soap’ from Dermaline/Diana stalder at night because it has Alpha Arbutin. It’s similar to hydroquinone but a more natural element. i leave the black soap on my body for 5-10 mins, my face 2 mins, do not leave the soap on your hands for too long wash it off before washing off the rest of your body, you hands will go extremely pale!. Also Note: that when your skin is peeling or sensitive only leave the soap on for 1 minute then wash off. While you are washing you may feel your old skin peeling on your fingers but do not rub or scrub okay? do not rub or scrub your skin period. 8.After I wash, I let my skin dry for 20 minutes or more. then I apply the Diana Stalder surely white body whitening lotions, it also has arbutin and vitamin c. But if your skin is peeling for the first 2 days only apply vaseline lotion intensive care or something that is not a whitening product. If your skin is peeling wait until it has peeled for 80 percent then you can start putting on whitening lotions. 9. If you still see no results after a few weeks in skin lightening then it is time to consider having a peel. Do not get chemical peels unless you have deep scars you want removed or if you think that your pigmentation is clearly on the dermis not on the epidermis. You only want to peel the superficial layer off your skin so I use ‘Maxi-peel no3’ its not the cream the cream does nothing, get the solution a very small bottle where it says hydroquinone and tretinoin on the label. Use a cotton ball and lightly rub lightly wipe it on the areas you want to lighten. Make sure your skin does not have scratches, irritated bumps or open wounds as this will sting alot and the peeling will be uneven leaving scars or pale patches on your skin. Do not use the solution on more than ten percent of your total body surface. 10 percent includes your face, neck and elbows. so if you want to lighten your arms and legs or your chest then only do half an arm or half a leg a day. Only apply this solution once a day for 2 or 3 days. Once your skin starts to peel even a little bit – discontinue use immediately. It will peel naturally and do not pick, scratch or pull the peeling skin as you will be creating lesions and new skin that was not ready to be exposed and get infected or discolor. Also when your skin first startz peeling you can use the Black soap and gluta soap when washing but only leave it on for 1 minute no longer as if you leave it on longer it will irritate the skin and cause a form of dermatitis. Wear double the amount of sunscreen during the day. After your skin has peeled your whitening regimen will be more effective and results will be faster as your skin is new, soft and thin and easier for bleaching products to penetrate. You can continue using the products I mentioned above in the normal pace. You might wanna get a bleach at the local cosmetic clinic or in Dermaline clinic, they bleach your whole body but wait for a week after skin has peeled so your new skin can build some form of resistance. Do not get a bleach in the clinic if your skin has any open wounds, broken skin, irritation, scratches and abrasions or even pimple or other bumps. Make sure your skin is flawless and smooth. If you bleached your skin with these abrasions the area where it has them will become paler than the rest of your body and you will end up getting pale and normal patches on your skin. Not attractive. If you do get them even if you have no abrasions on the skin make sure you evenly put the bleach on and do not bend your arms or legs while you are getting bleached because the bleach cream will pile on the bent areas and lighten it more than the rest of your body. The same thing can happen when you are using the black soap. 9. For a whitening regimen you cant expect it to happen quickly, prepare yourself to wait for 6 months or more or until you have achieved your original skintone. Just because you have finally stopped your whitening regimen doesn’t mean its time to go out in the sun without sunscreen or protective clothing you still need to do these things to keep the color you desire. can i use my maxi peel in my arms? my hands are dark unlike my face and legs? Hi i’m so unhappy with my skin especially my face,I have been suffering with Melasma for a very long time now about 13years…I have try so many products been to so many dermatologist..it clears up for a little bit then it comes right back again….if any one know off a an excellent product that i can use i will truly be happy …. does glutathione makes u pale or kojic acid soap? i m just 20, can u plz help my problem, my face,hand,leg, s black becoz of over exposure to sun, Wt can i do to light my skin, plz help me,., i feel very odd to sit near my bright frnds. plz help me. I have sever hyperpigmentation on about 80% of my face due to pregnancy, tanning and tanning creams. I’ve tried IPL laser one time with no change. Could u please tell me the best way to even out my skin. My face always looks dirty. I did go to Dr Sapra in Oakville, Ontario, I wanted fractional laser….little down time and a one to two treatment thing….he wanted to do a very high maintenance kinda peel with up keep of 4 weeks 3 to 2 times a day and down time of minimum 4 weeks. I’m desperate…I have to wear loads of makeup to cover and even out my face. I hate it. Please help…. Eternally grateful for any recomendation. Hi Kelly, you may want to try reading up on castor oil here and here. Hope that helps. Hi, I’m hopeful that you can suggest something for me. I’m 36 yrs old white female with a quarter-sized brown spot on my cheek that I’ve had for the past 12 yrs that has baffled dermatologists all over the country. It literally cropped up overnight. I wasn’t pregnant, nor was I on birth control (and still am not). I had it biopsied and it came back as a “sunspot”. I have tried EVERYTHING to treat it – nothing helps. I’ve tried: bleaching, cryotherapy (liquid nitrogen) about 20x (1x per month for 20 months), Fraxel (2x with no success), Q-switched Ruby laser (2x with no success), IPL laser (2x with no success), V-Beam laser (the doctor thought that most of the brown was actually “pink” and vascular, so he attempted to eliminate it with the V-Beam (didn’t work and actually caused some rebound hyperpigmentation), and I’ve tried the Q-switched YAG laser (7x with limited success). Each time I talk to a dermatologist, they feel confident they can help, but after several unsuccessful treatments, they give up and tell me they can’t do anything else. I’ve also tried several OTC treatments such as TriLuma, eLure lightening, etc … Absolutely nothing has worked on this spot. I’ve even gone so far as to consult plastic surgeons about literally cutting the spot out of my face. Unfortunately due to the sheer size of it, it would leave me with a horrible scar leading from my eye to my lip, so that’s not an option). Can you share any advice as to what to try? Thank you in advance for your reply! Hi Victoria, it’s a slow process that requires patience, but I think castor oil could help fade your spot. It might take longer since your skin would have to undo damage from all the lasers though. Castor Oil breaks up external and internal scar tissue. There’s a link there about treating a deep burn scar with castor oil also. Look at the photos, it might be similar to your spot in terms of the deep, dermal hyperpigmentation. Came across this blog/article while googling about Dermal Melasma. I got this in 2010 when I started taking BP meds. Didn’t know what the heck it was at first. I thought I had skin cancer. Asked my doctor and she said it was melasma and as added bonus it’s DERMAL melasma guys……oh happy day……. *rolling eyes*. Tried everything I could afford from my doctor’s prescription meds to OTC products and the two darker spots on the bone line under each eye just won’t go away(think of football players with those dark lines under each eye)….that’s what I’m talking about. I hate to go out anywhere. I feel so self-conscious. Today(11/27/13) I’m starting my Castor oil routine(please tell me the castor oil will reach the dermal layers of my skin). Since I have read more than one article about it’s effectiveness. At night I will wash with a mild cleanser and apply the castor oil. My morning routine will be to wash my face with a mild cleanser, put on a light application of castor oil…let that sink in, follow with Neutrogena Dry-Touch 30 spf sunscreen with helioplex broad spectrum uva-uba, followed by a mineral powder foundation(have been using Physicians Formula and Dermablend Concealer, which IMO does nothing to hide those horrible dark brown lines. Think I will stop using it. Hopefully someone one on this board can recommend a better concealer for me. Oh, I’m an African American female, tan skin color and 68 years of age. This melasma has made me a virtual prisoner in my own home. I’m tired of this. Should I take vitamins too? Of course I will consult with my doctor if I decide to take vitamins. or anything else. I think I need to start fighting this on the INSIDE as well as the outside. I read Vitamin C is good and also Folic Acid pills. I already take Edarbi(40 mgs) 1x a day and Hydrazaline(10 mgs)2x for my Hypertension. I know the drill about staying out of the sun and wearing hats. I’m willing to do whatever it takes to get this melasma on the road and away from my face. LOL. I need help guys. Hi Joann, you may find this article on melasma interesting, especially the ‘Comments from readers’ section, one lady also had melasma below her eyes and used castor oil for it. I really think you’re doing the best thing by healing from the inside out. Also you may want to look into getting some good probiotics in your system if that’s a weak area for you. I’ve found that after I got my intestinal flora really healthy, everything else started to improve as well (skin, stress, hormones, immune system — they’re all made better with good bacteria). I have discoloration between my legs. (meaning it is darker then the rest of my skin) I used lemon juice (as it is acidic enough to remove the top layer of discolored skin) and it took away 70% of the darkness. No matter how much more lemon I use the color does not fade anymore. Does this mean I have dermal hyperpigmentation? If so what works for that type of hyperpigmentation? obviously cream is not the answer. What do I have to do? Do bleaching creams work for dermal pigmentation problems? I have a dark pigmented skin on my cheek I have tried various lightening creams but none of them seem to be working. Please help. When I was younger, I used a product called Freezone corn removal on each of my toes, for a couple of months. It was so bad that i would have scabs, remove them and apply the product again . I would even see a tiny bit of blood coming out of the poors on my toes. I was yound and dumb and didnt know any better. Now, years later, I have lost pigmentation on my big toe in the area where I applied the product and on my four other toes, I have hyperpigmentation on the spot where I applied this product. I also noticed the skin on the toes, on the area I’ve applied this product, is thin and wrinkled. Is there a way to remove the hyperpigmentation and grow back healthy THICK skin back in that area?